Workaround ( NOT for production server ) is to disable session cleaning cron job ( /etc/cron.d/php5 ) as reported here http://ubuntuforums.org/showthread.php?p=11355965 . We think fuser was added to cater for some edge case of process not closing the session file, but was never tested with a large number of sessions. The fuser check was added to not delete still active session files (e.g. created long time ago, but still actively used by php5 process). Maybe it's an interesting point that i have this problem only if the php-apc package is installed. Ubuntu 11.10 with php-cgi (php5) and libapache2-mod-fcgid causes this, however I only seem to have the problem on heavy loads - or at least with rapid page loading. Is it after certain amount of page loads that the cleanup process will have too much to clean up? I only noticed there was a problem when some user was mirroring a php-site. Workaround with removing the `fuser` part in /etc/cron.d/php5 seems to be working so far. Would perhaps running the cleanup cron-job more often make the impact smaller? It seems like some 'update' modified my modified cronjob :-/ Just had it happen again. It happened for me today for the first time. What kind of update might have taken place? I did not find any package update concerning php in the last few days. if you have automatic updates enabled. You might find the affected packages there. @tanghus I think it was just a mere coincidence or something much more complicated could have caused this. I applied the workaround from comment #4 and so far I had no problems with it. I am having this same problem. 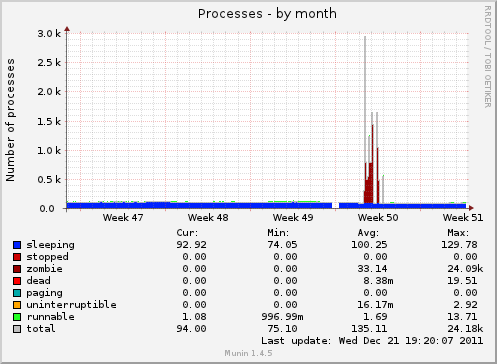 fuser has 23898 defunct processes now on my server. 11.10 x64. nginx, php5-fpm, php-apc. I can confirm the bug on Ubuntu 11.10 x64, lighttpd, php5-fpm (without php-apc). Found this older Debian bug via Google: http://bugs.debian.org/cgi-bin/bugreport.cgi?bug=633100 . Maybe it provides anybody with more information on how to hunt this bug down? Subject: "Cron <root@lvps176-28-19-116> test -x /usr/sbin/anacron || ( cd / && run-parts --report /etc/cron.daily ) (failed)"
instance is still running. Please check and correct if necessary. run-parts: /etc/cron.daily/standard exited with return code 1"
…whereas /run/lock didn't even exist. So I (re-)created the directory. Let's whether this fixes it. This bug affects my system in following way: I have "cameramonitor" package installed which periodically calls `fuser /dev/video0`, also I have "nproc" limits set to 600 in /etc/security/limits.conf, so periodically all my threads resources are getting exhausted, which leads to faults in some programs that tries to create thread at that moment. The most noticable problem is with Pidgin --- it quite often hangs in pthread_cond_wait() with stack trace similar to specified here: https://bugzilla.gnome.org/show_bug.cgi?id=666957 looks like because gstreamer fails to fork. Switching to the Ubuntu 11.04 cron script has fixed this problem for me! Could you try installing psmisc (just psmisc, there's also latest php5) from https://launchpad.net/~ondrej/+archive/php5? This should fix the fork()ing of fuser. psmisc has been installed, and i noticed there's an update to the php5 package this morning, but it seems fuser sometimes take 9999% of the cpu from top command line. i also use php-apc package too. Just to be sure you are running correct version? Thank you, graham-poulter. This solved our issue. Note to other users affected: If `ps ax | grep fuser | wc` still shows lots of zombie fuser procs: after modifying the cron.d entry, you may need to kill the runaway find processes. In our case we had three overlapping finds running, which caused the number of fuser procs to rise and fall between 5000 and 16,000 long after fully disabling the cron.d entry. This morning I found out again there's too many zombie process and fusers were all over taking 9999% CPU usage. at that time, apache2 seems couldn't parse index.php and make the directory listing available/vieable to public. I then restarted the apache2 serviecs and the index.php worked again. crone, there is psmisc 22.15-2~<dist>+1 in the PHP5 PPA which I have asked to test. Hence your testing just confirms what we already know. The bug was fixed in psmisc 22.15. Installing onderj's PPA psmisc fixed the issue for us (without editing the php5 cron). Thanks Ondrej! From the Debian bug discussion, this appears to be a problem with psmisc and not really fixable in PHP5. So I'm going to mark this as Invalid for PHP5, and Triaged for psmisc. It may be worth bringing in 22.15's fuser into 11.10 to fix this, as I can't imagine php is the only thing that regularly makes use of fuser. Yes confirmed on Ubuntu 11.10 running 3.0.0-17-generic kernel and PHP 5.3.6-13ubuntu3.6 with Suhosin-Patch (cli) (built: Feb 11 2012 03:26:01). > Yes confirmed on Ubuntu 11.10 running 3.0.0-17-generic kernel and PHP 5.3.6-13ubuntu3.6 with Suhosin-Patch (cli) (built: Feb 11 2012 03:26:01). And ... have you tried installing fixed psmisc as told several times in this bug report? is this still present on 12.04 ? inb4 a server update. and this is mission critical. @Phillip Kleinhenz: It's fixed in psmisc from 22.15-2 (as mentioned above in my posts). thank you. I wasn't aware there had been an point release including this fix. @Phillip: Yes, it's still present in vanilla 12.04, just ran into this bug this morning. Grr. a lot of "fuser" get over 20% of my CPU all time. If you really feel the urge to write "Me too." (instead of just clicking at the top of the page), please at least provide some useful information. The version of Ubuntu, it's architecture, version of PHP 5 packages (php5-common should suffice) and version of psmisc package. Unsure how to list versions of other PHP packages, but happy provide more information if needed. But this feels like a bandaid solution - I'd like to get this sorted out properly. It takes other approach which should be lighter to the system, but I need a confirmation from users before I apply it to Debian package (and before it gets pulled to Ubuntu). This modification to cron job has been uploaded as php5 5.4.9-2~<dist>+1 into my PHP5 PPA.